Band member: Writing process is the same, but "we just trust it more now"
(CNN) -- The Indigo Girls navigate the challenges of today's recording environment with their new two-disc album, "Poseidon and the Bitter Bug." The Indigo Girls, Amy Ray, left, and Emily Saliers released their latest folk-rock album on Tuesday. Rather than abandon ship amid the country's economic recession and after being dumped by their former label, the folk-rockers decided to release the album independently -- and they recorded it in a mere three weeks. The veteran Atlanta, Georgia, duo remains optimistic about America's recording industry and the ability of artists to market themselves online. But nothing will replace a heartfelt live performance, said Amy Ray. 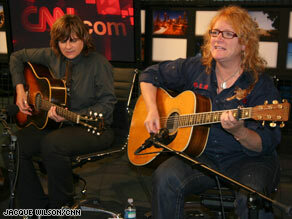 CNN talked with the Indigo Girls about the Internet, food, their Southern roots and their newest album's strange name. The following is an edited version of that interview. CNN: What's been the primary influence for you all? Has it been a place, like Atlanta? Or has it been something else? Emily Saliers: Atlanta and the South, just in general. ... Some of it comes through the content and some of it just comes through a vibe. We're sort of a hootenanny bar band. We cut our teeth in Little Five Points Pub, and what we always like to do is bring people up on the stage and jam with us. ... We tie it back to the days when people just sat on the porch and played together. It's a very Southern thing, an Appalachian thing. CNN: Tell me about the title for this album. Saliers: Mitchell Froom, the producer, came up with the title, and it was originally a joke. He said it and he laughed -- and we all laughed. Naming a record is probably one of the hardest things in the whole process, and that name just stuck with us. And it's also cool because "Poseidon" is a reference to a lyric in one of my songs, and "Bitter Bug" is a reference to a lyric in one of Amy's songs. So to be able to fit two of those pieces together in a way that works is cool. CNN: And you all are working as free agents on this [album]. Tell me about that. Creatively we've always done what we want, but on the business level it's demoralizing when you feel like there's not a team anymore because the label you're on isn't really behind you or doesn't know what to do, or is kind of paralyzed by the industry, generally. CNN: What are you all listening to lately? Saliers: You know, I just bought yesterday -- I downloaded it -- Sean Lennon's last record. I saw him on some obscure Japanese channel when we were in some other part of the world and I really like the sound of that. And then this artist named Sia. She sang with Zero 7 and she's a really good artist, I like her stuff a lot. I like the Weepies. CNN: You [Emily Saliers] are a part owner in a restaurant here in Atlanta. ... Is there any kind of relationship between music and a good restaurant experience? I think the experience of sharing food is a lot like the experience of sharing music. It's just something that people's work goes into it and a lot of love goes into it, and then you share it together. CNN: I wonder what you make of Twitter and artists playing on Second Life and sort of all of these virtual personas that people have these days. My nieces and nephews, they're very involved in [the video game] "Rock Band" and stuff like that, which I think is really great because it's introducing them to music, but I just want them to go outside sometime, too. (laughs) That's all. Play in the woods a little bit. CNN: How has your collaboration changed over time? Over the years we've picked up a few more instruments, so texturally we're more expansive than we were when we were just two guitars at the very beginning. Now there's harmonica and mandolin and banjo -- a little bit of keyboard. We mix that up, but the process is pretty much the same. We just trust it more now.